Residents at a Cringleford care home are enjoying a transformed garden, thanks to the efforts of a group of police cadets. Cavell Court, on Dragonfly Lane, now boasts newly-painted garden tables and chairs, an improved sensory space and plenty of handmade enclosures to attract local wildlife. Panola pansies, begonias, bellis reds and dwarf conifers have also been planted, adding to the existing displays. 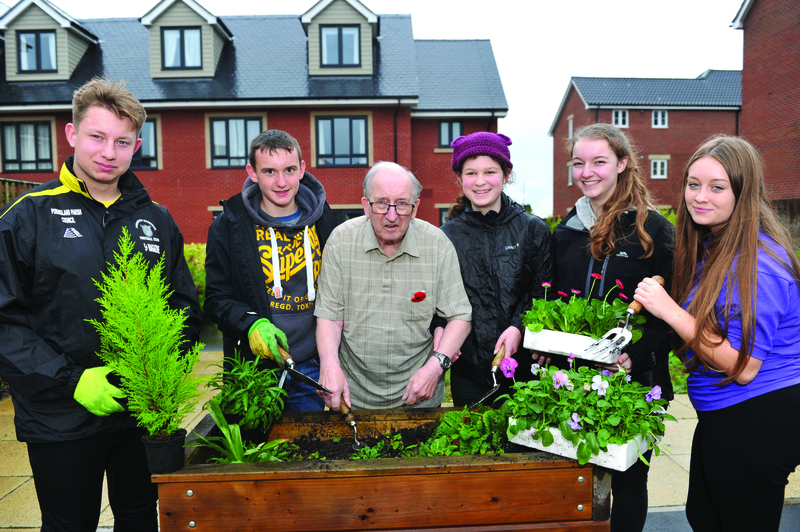 The cadets and their leaders joined residents as part of a community project which also aimed to encourage friendship between different generations. Youngsters helped residents make fat balls for the birds and create colourful decorations such as pinwheels to brighten up the outside space. A total of 40 handmade birdboxes have also been added to the garden, with all of the timber donated by a local Jewson’s branch. Afterwards, the police cadets joined residents, their relatives and the Care UK team for a well-deserved buffet and firework display. Richard Lawson, home manager at Cavell Court, said: “We’re so grateful to the police cadets who helped spruce up our garden, the project proved to be a real success and you could see from the residents’ faces just how much they enjoyed spending time with the cadets. “Intergenerational relationships have been proven to be beneficial to older people, and it was clear that the residents at Cavell Court really enjoyed the afternoon. Cavell Court is an 80-bed care home which provides full-time residential, nursing and dementia care, as well as short-term respite care. This entry was posted in Eaton & Cringleford, Home Page and tagged Cavell Court, Cringleford, Norfolk police cadets on December 8, 2017 by Gay Webster.